Tennessee Loveless at "Drag Friday" Small Business Saturday ArtInsights! 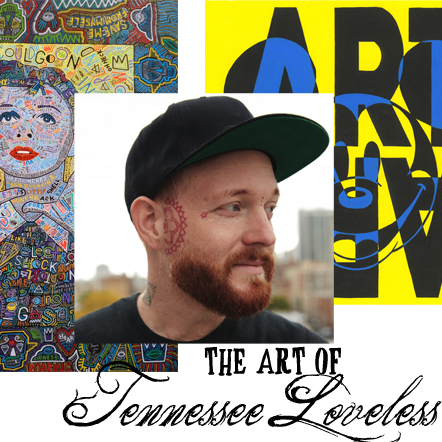 Home » Tennessee Loveless Appears on “Drag Friday” and Small Business Saturday at ArtInsights! Reston, VA – In conjunction with ‘Black Friday’ holiday events at Reston Town Center and Small Business Saturday, ArtInsights welcomes Tennessee Loveless for a book signing and an exhibit of original and limited edition art from the new retrospective book “The Art of Tennessee Loveless” and the worldwide exclusive premiere of new images from The Art Outsiders Project by Tennessee Loveless. The Art Outsiders is a portrait collection of important and influential creators who, through their struggle and determination, have changed the world with their unique genius. The Chicago-based, internationally known artist will be making a personal appearance 2:00 p.m. until 6:00 p.m. on Friday, November 24 and Saturday, November 25 at ArtInsights Gallery, 11921 Freedom Drive, Reston, VA. There is a display and sale of his original and limited edition art from the book “The Art of Tennessee Loveless: The Mickey Mouse TEN x TEN x TEN Contemporary Pop Art Series”, the first ever art retrospective on an openly gay artist in Disney’s history, and from his “Art Outsiders” series, including new limited editions of Prince, Grace Jones, Judy Garland, and Billie Holiday. As always, gallery admission is free. For more information, contact ArtInsights at 703-478-0778 and visit HYPERLINK “http://www.artoutsiders.net” www.artoutsiders.net. The new book release is important because it marks the first time Disney publishing has released an art book representing an artist who is out and proud. Tennessee is also known for several other projects, including the “Drag Landscapes”, where he creates portraits of drag artists, and similarly to Art Outsiders, tells the story of these performers, whom he travels the world to interview, inside the body of the portrait. Tennessee’s career included and Award-winning stint working as Disney Consumer Products, so it’s a natural, as well as an honor, that Disney would choose him to represent this important first in their publishing portfolio. His fine art representative and partner in The Art Outsiders project is ArtInsights owner Leslie Combemale. The gallery is excited to have the artist present to unveil new limited editions from the ever-expanding Art Outsiders series on the holiday weekend. From her perspective, the fact that Loveless is colorblind and limited in his ability to see color, is a fascinating after-thought in considering Loveless’ unique talent and artistic voice. “Tennessee’s art comes from his entire being, and his life experience. It’s true he has had to choose colors based on psychology rather than a personal visual understanding, but that is only one aspect creating the unique depth of his images. The TEN x TEN x TEN series is a fascinating look at how a popular icon can be manipulated to inject cultural context. The Art Outsiders project, for example, he is entirely immersing himself in the lives of the artists he is painting. He is speaking to their struggle, importance, and relevance. I’m thrilled it’s being so well received. People either love or hate his art, and I think that’s a great sign! It’s true for all iconoclastic contemporary artists”. Loveless comes by his love of drag through his own experience as an accomplished drag performer both in San Francisco and Seattle with Trannyshack, the drag performance group founded by Hecklina at the Stud bar in San Francisco in 1996. He is also the founder and programmer of the Internet music show Beautiful Noise Broadcast, which has since morphed into Gorgeous Sound Underground. ArtInsights is a privately owned gallery located just outside Washington DC at 11921 Freedom Drive, Reston, Virginia, in Reston Town Center. The gallery focuses on official art from all the major studios, including Disney, DC, Marvel, and Warner Bros., as well as proprietary projects and artist representation relating to the history of animation and film, and the celebration and examination of popular culture. With artists like Tennessee Loveless, John Alvin, and Jim Salvati, the gallery builds collections of original and limited edition art for their growing worldwide collector base. Open since 1994, and co-owned by Combemale, ArtInsights is expanding to allow the display of the contemporary work of artists and art projects represented by Combemale Creative, her company for international art consulting and artistic representation. The gallery has Loveless’ Art Outsiders art as well as representative art from his entire career, including drag queens and 10x10x10. Visit ArtInsights at HYPERLINK “http://www.artinsights.com/” www.artinsights.com. For more information about The Art Outsiders project and Tennessee Loveless, visit HYPERLINK “http://artoutsiders.net/” artoutsiders.net.